The Reigate Borough Isolation Hospital, near Whitebushes, in the parish of Horley, opened in 1900, at a cost of nearly £17,000, comprises an administrative block, others separately assigned to scarlet fever, diphtheria, and typhoid cases, laundry and offices; the total number of beds is now 50. Reigate Municipal Borough Isolation Hospital at White Bushes was built in 1900 at a cost of £18,000, and is available for 45 patients. Reigate Rural District Infectious Diseases Hospital, situated here, was built in 1885 at a cost of £2,500. There is now a Brick Field and Kiln to the east of Bushfield Shaw, which is still a wooded area extending between a track where Spencer Way is now and the footpath on the southern edge of the common. The Kiln was researched a while ago and they found a variety of pottery items. Kelly’s Directory of 1913 lists Arthur Frank Gwynn of White Bushes, Earlswood, Redhill in the brick makers section, although it isn’t clear to which brickworks he is related. The cottages between Mayfield and Spencer Way have been built (1905) and are shown. Behind them is a new Brick Field and the fishing lake between Ivydene and Lavender Closes is shown for the first time. Presumably this was simply the excavation for clay for brick making. There is new brickworks south of the lake, Fox’s Brick Works established in 1903, which survived until 1971. There is another new Brick Field to the south off Green Lane and a structure is shown where The Bungalow now exists. The 1911 Census shows George Fox and family living in The Bungalow, presumably the proprietor of the Brick Works. His family include his wife Martha Ann, three sons and two daughters. 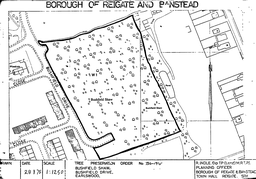 The 1934 OS Map shows some more development in the area and the Isolation Hospital is now one entity run by the Reigate Joint Hospital Board as part of the Redhill County Hospital, the transfer taking place around 1927-1928. 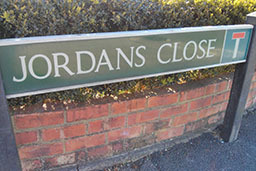 By 1966 Spencer Way has been named and the hospital is now called Jordan Hospital run by University College Hospital. It was acquired by UCH in 1950 for the treatment of Tropical Diseases, primarily leprosy. More details at the Lost Hospitals of London site. The Director of the hospital was Dr William Jopling. The land was sold for redevelopment in 1970 and this is when the houses in and around Jordans Close were presumably built. The Surrey Mirror’s Yesteryear column published a couple of articles about the nurses who worked at the hospital who had published a memoir of a road-trip across America, Bedpans & Bobby Socks. The first article, “Gwenda’s tales of the leper hospital” was published in March 2012 and the second, “Nostalgia: Nurse looked after lepers at Whitebushes hospital in the 1950s” in September 2015. The 1966 map also shows the engineering works in Spencer Way near Ivydene Close. I know these works as Spencer Engineering but I have discovered a planning application appeal from “Tenga Engineering” in May-Nov 1966 also for Spencer Way. Whether these are related I am not sure. I am also unsure how the ‘Spencer’ in name of the road and the engineering works is related, which was named after the other. A small section of the original Brickfield Shaw wooded area can be seen in the middle of the development, near Kiln Walk. These trees were made the subject of a Tree Preservation Order (RE34) in July 1975. By coincidence it seems infectious diseases have returned to Whitebushes, as reported by the Surrey Mirror.